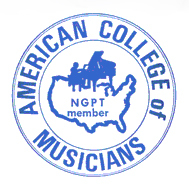 The primary function of the National Guild of Piano Teachers (NGPT) is to establish definite goals and awards for piano students of all levels and (Musical) grades. These goals attempt to prevent aimless drifting and give music study some definite direction and provide a measurement for progress. Students are evaluated on individual merit in the areas of accuracy, continuity, phrasing, pedaling, dynamics, rhythm, tempo, tone, interpretation, style, and technique. Auditions are private – student and judge only. The NGPT is an annual event and is held at The University of Tampa historically late May or early June each year. This evaluation encompasses a broad test of keyboard skills plus repertoire pieces and their musical interpretations.